This photo was taken December 2006 before the city of Rochester destroyed the habitat. 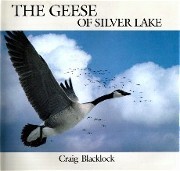 HISTORICAL SIGNIFICANCE: When Earl and I visited Rochester in April and September 2006, we were impressed with the city and our favorite spot was Silver Lake, with its history linked to Dr. Charles Mayo and his role in the resurgence of the giant Canada geese. This history was told in the pages of the Rochester Visitor's Guide titled, "Magical Silver Lake." Silver Lake was peaceful and we loved mingling among the geese and watching visitors feed the geese. FAME AND TOLERANCE: The geese of Silver Lake have been mentioned in books, magazines and their poop has also been immortalized by artist Gary Blum, a Rochester resident. 2006 PHOTOGRAPHS: We took these photos during our visit. I also visited in December 2006. 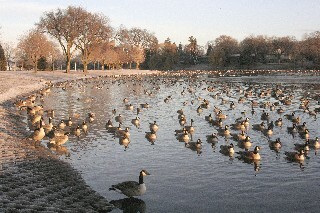 2007 - ALARMING DEVELOPMENTS: The city of Rochester takes steps to drastically reduce the population of Canada geese: Removal of the geese food bins and creation of buffer zone around shoreline. We create a petition opposing the buffer zone because of its detrimental effect upon the large numbers of crippled/ flightless geese. 2007 PHOTOGRAPHS: Joe Tenley, Rochester resident and wetland specialist, sent us photographs showing the creation of the buffer zone and the fencing around Silver Lake. FROM FAME TO SHAME: GEESE TO BE HUNTED IN REFUGE! As a result, Rochester has earned her place in the Canada Goose Hall of Shame.